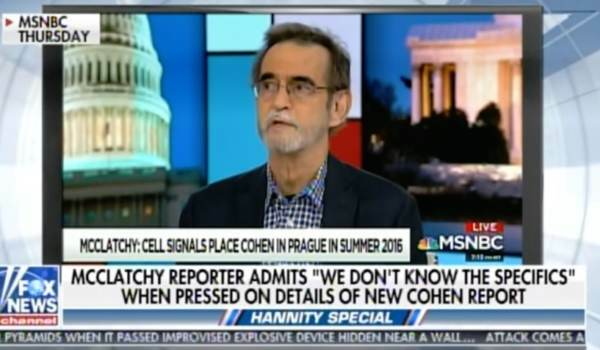 On Thursday McClatchy hacks Peter Stone and Greg Gordon released a liberal media “bombshell” that Michael Cohen’s mobile phone was traced to Prague, Czech Republic in the fall of 2016. This is the proof the left was looking for to help solve the mystery of the junk Trump-Russia dossier! Then Michael Cohen tweeted this – insisting, once again, that he has NEVER been to Prague. This is the one claim Michael Cohen has been consistent on in the last year. McClatchy “reporter” Greg Gordon later admitted he did not have a first-hand source for his story, or a second-hand source. His source was a third-hand source. In other words, the report is complete junk. If Mueller knew Cohen met with Russians in Prague it would have been leaked to the liberal media months ago. It was the latest junk report in a long line of embarrassing junk reports. The fake news liberal media can NEVER be trusted to tell you the truth.